Archives of Eaton Bray News for April 2008. This always promised to be a tough encounter for Lions, facing league leaders Luton Borough, but having held on to a narrow 3-1 defeat previously, there was understandable disappointment at the end result. And so there should have been after an accomplished performance from all players. Forwards David Wood and Toby McGee worked hard on the ball and made some promising runs, while midfielders Luke Jearrad, Matt Kennell, Connor Tough and Jack Reynolds produced a string of impressive one-twos to bind an ever improving Lions side. In defence Bradley Hicks, Daniel Challis and MoM Robert Bunting held off a heavier defeat. Keeper 0llie Mulcahy faced a sustained onslaught but saved more balls than Luton Borough were able to net. This was always going to be a hard game, away to the top of the league. Lions started strongly and had a lot of the possession but couldn't find a way through a well organized defense. Lions were solid at the back and coped well with anything that came their way. At half time it was still 0-0 and everything to play for; Lions made their substitutions and started the second half well. Ten minutes into the second half Lions had a harsh penalty awarded against them and went one down. Then four minutes later, with a free header, Crawley scored again. Lions continued to try and get one back and came close a couple of times but it was not to be. Lions maintained a recent surge in form to draw 1-1 with Brache Sparta on Saturday thanks to a last gasp goal from Dominic. A gripping encounter saw the visitors press the home team relentlessly from the opening whistle, with a catalogue of shots fired in from all angles. In the end it was testament to the skills of the Brache keeper that Lions were able to net only once. Stand in keeper Ben nevertheless had his hands full and easily matched the opposing goalie with some sharp saves and confident takes. Excellent defensive work from perennial star performers Aarin, James and Mason kept the Brache strikers at bay, while Charlie, Adam, Sean and Tom all had scintillating chances on goal. Chris, playing in defence, prevented a handful of corners but Brache went ahead in the first half, a lead they would retain until the final ten minutes. After a great season this was the match when it all came together for Lions. From the start Lions looked good and were always in control. Against a strong wind it was 9 minutes before Lions got their first goal from Darcy with a great volley from a corner. After 20 minutes Megan got her first goal, Lions' defence of Devon, Beth and Shannon were solid and coped well with a strong wind. Lions' manager was confident that playing with the wind in the second half would ensure more goals. One minute after kick off Megan got her second and ten minutes after Darcy (GoM) got her second. Then with three goals in three minutes from Megan and a penalty from Hattie, Lions were on the way to their biggest win of the season. Lions' midfield of Elsa and Emily controlled midfield totally so goalkeeper, Nancy, had little to do but pull off a couple of good saves when needed. A spate of thefts from cars and vans has been reported in rural areas near Luton and Dunstable. Now the series of vehicle break-ins has sparked a police warning to traders and drivers. There has been a rise in the number of vans broken into in the Barton and Silsoe areas in recent weeks. Power tools, including drills and circular saws, have been taken. In Eaton Bray, more cars are being broken into and valuables have been stolen. Det Con Richard Foulkes said: "We don't want to alarm motorists, simply to make them aware of this emerging pattern, so they can take the appropriate precautions and together, we can nip it in the bud." Police advise traders to remove, where possible, all tools from vehicles at night and put the items in a secure place; ensure tools are security marked and adequately insured; fit vans with alarms, immobilisers and security chests; black out any windows and fit security grilles; back vans up to a wall to make it difficult for rear doors to be attacked; and attach stickers warning that no valuables are left in vehicles overnight. Motorists are advised to park their cars inside a garage; fit security lights over driveways; remove valuables, including sat-navs, laptops and coats; use immobilisers or alarms; and fit index plates with tamper-proof screws. Anyone with information that could help to catch the culprits should contact police, in confidence, on 01234 841212, or Crimestoppers, anonymously, on 0800 555111. Two women have been charged in connection with the theft of thousands of pounds from a bank where they worked. Hannah Carre, aged 22, from Eaton Bray, and Margaret Busani, 44, of Dunstable, have been charged with theft by employee and false accounting at the NatWest Bank in Harpenden between November 1 and December 31 last year. They are due to appear before magistrates next week. Jones won the toss on a wet Potten End track (has it ever been dry there?) and inserted the opposition. One wicket a-piece for Peacock and Roff gave early hope, but a big 3rd wicket partnership set a testing total for the Bray. Tight bowling from debutant Martell & skipper Jones ensured the hosts finished with 185-4 off their allotted 35 overs. Peacock then set about the chase with a fine array of shots, proving that he was technically the best batsman on display all game. To take his game further, he needs to ensure he 'gets the job done' and must not sell himself cheaply, this time shortly after reaching his half century. Also worth mentioning Hing's slog sweep onto the pavillion roof!! At 115-2 and 14 overs still remaining, the chase was on. Then came the decisive moment when Hing played forward to a ball that bounced and turned and was unbelievably given out lbw by the home umpire. Hing was later fined half of his match fee for refusing to walk (and rumour has it he is still stood there now shaking his head in disbelief). A dramatic collapse followed, with the same 'umpire' giving two more lbw's, although one batsman did admit he was probably plumb. At 120-8 the game was lost but Martell, with some fine hits, ensured the Bray batted out their allotted overs with the tailend stalwart Jarrett at the other end. Nets for everyone this week please. The Carnival Queen, Princess and Attendants were chosen this morning in Eaton Bray Village Hall. The 2008 Carnival Queen will be Holly Potton. She will be aided by Carnival Princess Jemma Flitton and Attendants Isabel Dorrence and Devon Brown. The St Mary's Village Carnival will be held on 5th July 2008 with a theme of Fairy Tales, and this year High Street Hair of Eaton Bray will style the hair of the Queen, Princess and attendants. Let's give Eaton Bray man Stuart Harding a big hand, as he bows out of the company he founded, Theatre Breaks Ltd. The 70-year-old managing director, pictured on the right of our picture, is stepping out of the spotlight, and his son Simon is now taking centre stage. Stuart isn't just a groundbreaking businessman, he's also a singer, actor and musical director. When he set up the company, in 1980, it was called Theatre Rail Club. Stuart launched it at the Royal Opera House, at an event packed with VIPs. It was the first time that entertainment, travel and independant business had been combined into a one-stop shop. That was a brave move - his background was with British Rail, where he was senior sales marketing manager for the whole rail network. Anne Main MP dropped into the St Albans office to wish him well on his retirement. I hear that he'll be keeping in touch with the company and the theatre world. And as the curtain is brought down on Stuart's current Theatre Breaks role, I rather think he deserves a standing ovation. The farmer caught up in a row over a dog being shot dead on his land has defended himself this week, saying he had little choice but to act as he did. Last week the Gazette reported that pet owners Martin and Barbara Surman were devastated by the death of their 14-month-old whippet Chica and had branded the killing "callous". But Bill Rawding, who owns New Cloud Farm in Eaton Bray, said that he had warned the couple about their dogs running loose on his farm before and had to take the action in order to protect his sheep. Mr Rawding said that he shot Chica after spotting her in his field attacking lambs. In the past he says he has lost hundreds of animals to dog attacks, and days before the incident he had lost two more lambs. The farmer told the Gazette: "It's not something I did lightly but this was a situation where people were not controlling their pets. "They forgot that their pets are hunting animals. The dogs don't realise they're doing any harm, they think they're just having fun, but that turns nasty when the blood starts to be spilled." And he continued: "One of our own dogs turned savage a while back. "The dog had been round sheep all its life but it turned into a sheep killer. "In the end we had to have it put down." The latest incident, which happened nearly two weeks ago, came right in the middle of the lambing season, which many farmers depend on for their income. Mr Rawding said that sheep-worrying can have a number of knock-on effects, including pregnant ewes losing their babies and having difficulty feeding. And he said that once a dog has attacked sheep once, it often escalates still further. The farmer had already chased Chica off his land before, but when he spotted her again he ruled that more extreme action was necessary. Mr Rawding said: "I could have tried to chase it off again, but then I'd have had the same problem I have every day. "It's all right saying: 'You could have chased it off again', but what about the next time?" He said he first spotted Chica in his field around 10 minutes before he came back with his rifle. "The dog was still attacking the sheep, he had hold of the lamb, so I shot it," Mr Rawding stated. And he denied claims made by Mr Surman that he had thrown the dead dog back at its owner, instead saying he had handed the body back over a gate. The farmer said that he had been straight on the phone to the police to report the shooting and said that officers had been in the field to investigate. Beds Police said that Mr Rawding had acted within the law and it had no concerns about the farmer owning a gun. But Chica's angry owners said that the laws should be changed to prevent dogs being killed in a similar manner in the future. The opening goal for Lions came seven minutes in, as Connor Tough set up Matt Kennel) for a deft finish. More good runs came by way of Toby McGee to keep the pressure on a tough St Joseph's side, who were forced to play defensively. The occasional attacking burst was quickly dealt with by a steadfast back line comprising Bradley Hicks and Robert Bunting, who stopped every forward play made by the visiting team. Following the break, St Joseph's reapplied themselves and pressed forward, inspiring Ollie Mulcahy to bring out his finest work. Sam Bramston switched to a forward position and put together a string of attacking plays, while Jack Reynolds in midfield moved forward with vigour to further harry the St Joseph's defence. A sequence of needless goals trickled in during the final ten minutes to overturn the game and an impressive Lions team were left perplexed at the final result. MOM Mason won the ball with some relentless tackling and picked his way past a resolute Shillington defence, while an impressive Charlie swept down the wings time and again to deliver a host of shooting opportunities. Tom and Chris formed an impressive attacking partnership, outfoxing their opponents with some accomplished one-two passing, culminating in some stunning attempts on goal. The opening ten minutes belonged to the Lions as they kept the ball tightly wedged into the Shillington half, Adam and Aarin charging through a determined opposition. Shillington picked up towards the end of the half, forcing defenders Ben and James into some tricky clearances, either by their trademark scything kicks or else via breathtaking runs from end to end. Shillington increased the pressure during the second half, and Dan continued with the exquisite saves that have become his trademark. A cruel ball rolled in before the final whistle though, handing Lions a bitter defeat. 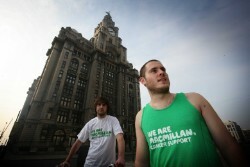 Gregg Roughley set out yesterday on a 223 mile run from London to Liverpool, over 11 days. To help him on the way he will be ably assisted by Adam Yates, who will be able to cycle, read a map and bark supportive slogans when Gregg's legs have forgotten who owns them. Today Gregg is set to arrive in Eaton Bray after his second leg which started in Watford this morning. Tomorrow he will then continue on to Stony Stratford. Gregg's mother Sylvia has emailed in to ask anyone that sees him around the village or en-route to please give him a wave! Gregg is raising money for MacMillan Cancer Support; "they are a wonderful charity who have offered fantastic support to me and my family and to many others around the country. I hope you will support our efforts to raise money for them so that they can continue to help cancer sufferers and their family members when they most need it." To donate money to Gregg and help him raise money for Macmillan, please use his JustGiving page at: http://www.justgiving.com/greggroughley. The home game against Totternhoe on sunday marked the start of the reign of Ian Jones as captain. A disappointing batting display in the main, Josh Peacock top scoring with 24 but at 80-7, and 15 overs remaining, a well below par score was looming. Phil Spicer and Joe Roff utilised vital overs before some big hitting from Ozzie Osborne and newcomer Steve Shepherd ensured a competitive total of 136 was achieved in the final over. Osborne and Shepherd then impressed with the ball, keeping Totternhoe to 10 runs from the first 10 overs, which would have had more success were it not for the ineptitude of skipper Jones in the gully, clearly with other thoughts on his mind as the ball looped towards him (like what he was having for dinner, supper and late night supper that evening). Suddenly wickets started to fall, and at drinks Tots were 36-6 and the game seemed won for the Bray. But Wood & Pretty (66no) had other ideas and secured a penultimate ball win for the visitors, with 2 wickets still in hand. Skipper Jones was so upset by the result that he has called a team meeting before next weeks game. This will take place at 2.30 am in Cubes in Dunstable (that is assuming that by this time, Jones has not been thrown out for throwing drinks over a barmaid). Plans to build a detached bungalow in a road in Eaton Bray will be back under the microscope after a planning appeal was lodged. In January, South Beds District Council rejected an application to put up the home on land next to 41 Moor End. 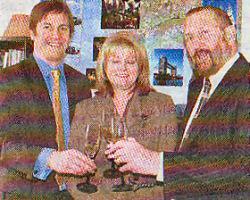 But now an appeal has been lodged by the applicants, Mr and Mrs Wright, for the council to have another look. Anyone who wants to comment on the proposal should do so by sending three copies of their representations to the Planning Inspectorate at 3/16 Eagle Wing, Temple Quay House, 2 The Square, Temple Quay, Bristol, BS1 6PN. The letters should arrive by April 28, 2008. The Annual General Meeting of the club was held in February and was well attended by 20 members. It was lively and long. It lasted 4 hours during which time the members elected a management team of Lee Bearton and Martin Quinn as president and chairman, plus Ian Jones and Michael Jarrett as treasurer and secretary respectively. The captaincy of all teams has changed hands. Andy Norris was elected as first team captain. Darren Kerins has dropped to the second team giving the 'twos' his tactical nous. An inexperienced combination of Ian Jones and Josh Peacock, his vice-captain, will lead the Sunday team. The first match is on Saturday 19 April, but ahead of that there is much preparation. Naturally the players will continue to fine tune or indeed learn some of the more rudimentary skills. The off-field preparations are also underway. Nick Pearson is repairing the cladding to the outside of the pavilion, but the bulk of the work will be done, as usual by the Flecknells. Whilst it is a cricket club, its social secretary Georgie Coughtrey does arrange other events. In February Brian Hing's team of masterminds won the quiz night and prior to that Lawrence Bunker's red-hot tip at Towcester, made a couple of pounds for the lucky few. On 12 April, an indoor race night is scheduled. It will be held at the Sports and Social Club. Tickets are available from Georgie. The club is always very encouraging of new members. 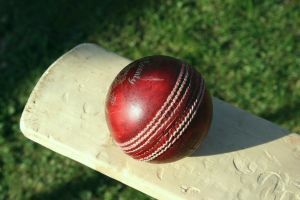 This season, in particular, the club is promoting junior membership, as it will be running some junior matches, in conjunction with Edlesborough Cricket Club. If you'd like to join, please contact Martin Quinn. Until now we have made a low key request for people who would be willing to open their gardens to the public for the afternoon of 8 June. At the time of going to press this has yielded eight offers and it would be a real help to have two or three more. Please, if you enjoy your garden and like to share it with others, consider taking part in this event, which has been incredibly popular for the past two years. Your garden can be large or small - it certainly doesn't have to be up to Chelsea Flower Show standards. And by opening your garden you will contribute to a major fund raising effort that will support the Macmillan Cancer Support and the repair of St Mary's roof. If you can offer your garden please get in touch with Gordon Gray or Kay Griffiths. A family pet which strayed onto a farm in Eaton Bray has been shot dead by an irate farmer, prompting her devastated owners to dub the killing "callous". The 14-month-old whipppet named Chica was killed after she wandered into New Cloud Farm in The Rye on Thursday. This week police said that the shooting was legal, as the dog was said to have been worrying livestock, a fact her owners Martin and Barbra Surman dispute. They described Chica as "one of the family", and said that they have had to lie to their children about how their pet died. Barbra said: "This is the most horrifying thing I've ever had to deal with. If your dog had been poorly or even run over you could cope with it, you could say it's sad but it's done. "But when it's an incident like how he's killed her, it's the worst thing I've ever had to deal with. She was a member of the family." And a devastated Martin added: "I just can't believe it, I can't get my head round it at all. It's just a senseless waste of a life. "The noise of that shotgun must have worried the sheep more than my dog can have." Martin was outside the farm when Chica ran off, and he said he was taken aback when he heard the shotgun fired. For the full story, see this week's edition of the Dunstable Gazette. See also: Dog shot dead for the sake of worried sheep - follow up article, 25 April 2008. With two key players missing this week Lions knew they would have to work hard to get a result and did just that. Away from home and with a strong wind and the slope against Lions in the first half they expected to have to battle for every ball. Approaching half time Lions got a well deserved goal scored by Karl. With no substitutes Lions started the second half with the same formation. After ten minutes Dax got a great goal straight from a corner. After that it was all Lions and they could have scored many more but with a packed defence and some good saves from the Dragons' keeper the match ended 2-0. MoM George had a good game as did Freddie, Charlie and Lee. In goal Harrison dealt with anything that came his way. This was a good team effort that could have seen a much higher score line. Two long punts downfield saw EB Lions lose two soft early goals. An excellent fightback was rewarded when Jack Cook fired in from long range and Jonathan Evans netted following up a cross shot pushed out by the keeper. EB Lions keeper Edward Lee had to make a couple of good saves diving bravely at the feet of a Leagrave striker. Another long range effort from Jack Cook sneaked in just under the bar to put EB Lions 3-2 up just before half time. After early second half exchanges EB Lions failed to clear their lines and were pegged back to 3-3 with a speculative effort through a crowd of players. Both teams had good chances in the final 10 minutes especially from Man of the Match Archie Bunker whose rasping shot was well saved but ultimately neither side could press home the advantage. A draw was a fair result. After a three-week break the Lions were raring to go. They were soon in control of the game with some excellent solo runs, intricate passing and tackling in mid-field by Mel, Megan and Georgia. The breakthrough came with GoM Megan scoring as a result of a solo run from the halfway line. Lions showed a loss of concentration allowing Woburn to equalise. They continued to soak up the pressure with some brilliant saves from Amber and with Holly and Liberty, in defence, cutting out many chances and providing great back up to the midfield. Up front Hannah and Steph kept the Woburn defence busy but the telling goal for Lions came from a great run by Mel resulting in a cross to Georgia who made it 2-1. All the Lions girls played brilliantly and showed great awareness in their passing play and also team spirit in the way they tackled and provided support throughout the game. Lions were playing the undefeated, top of the league team but the match was evenly balanced with Katie and Devon doing well in Lions' defence. Darcy, who was really strong in midfield, played alongside Elsa (GoM) and Emily and Lions controlled the game. Up front Megan and Hattie both had chances to score and were unlucky not to. After fifteen minutes Sacred Heart got their first goal and ten minutes later, from a speculative shot, they scored again. Lions made substitutions, started the second half strongly and continued to dominate right up to the final whistle. Although they hit the post a couple of times the ball would not go in. Beth and Shannon both helped to keep Lions' defence solid and in goal Nancy continued to play well. This was another great team effort and Lions continue to play good football and will only get better. Tuesday is market day - I love to see the stalls all laid up with fruit and vegetables - but the traders of today don't like to see you touch their wares. Years ago barrowboys used to shout, "If you don't want the goods, don't muck. 'em about." This was often addressed to a really thrifty shopper who would pick up and examine everything really carefully before deciding on making a purchase. No bruised or blemished fruit for her, nothing from the back of the stall, and it had to be weighed before being placed in the bag. She took no notice of the signs saying "Don't touch me til I'm yours." There are times when touching is appropriate, and times when it isn't. A hand on the shoulder may seem a very little thing but it can mean so much, or to hold the hand of someone who is really ill. It is a comfort to that person to know that someone is physically present and that they are not alone in whatever it is that they are facing. They may not be able to speak but just a squeeze of the hand can say far more than words. Words are sometimes very limiting. The gentle touch speaks volumes. However there are people who cannot bear being touched, and we must respect their feelings. Is it I wonder because for some reason we British are too reserved? Perhaps that reserve is beginning to break down, for many people now greet one another with a hug or a kiss, instead of the rather nervous handshake of years ago; so maybe we are becoming less restrained. Mary Magdalene was one of the 'touchers'. She was the first one to see Jesus after He had risen from the dead on Easter morning - she thought He was a gardener until He called her by name. Straight away she reached out for Him, but He said, "No". Instead He told her to go and tell the disciples that she had seen the risen Lord. Now hard that must have been for Mary not to have touched Jesus, and how hard it must have been for Him to forbid her. Then there was Thomas, he couldn't believe what the disciples said to him.. That is until a week later when Jesus appeared and said, "Put your finger here, and look at my hands; stretch out your hand and touch my side." (John 20:27). "And besought him that they might only touch the hem of his garment: and as many as touched were made perfectly whole." Matthew 14: 36. When we part company with friends or acquaintances we often say "keep in touch." - I believe that there are some people who have a special awareness; who seem to be "in touch" with the whole of God's world. They have a kind of sensitivity that enables them to approach life in a different way; - I keep 'in touch' with God through prayer, that way I can seek His guidance. Just think of all the people you will meet as you go about your business today. How will meeting you touch their lives?? Perhaps they will need a helping hand, or a listening ear, maybe you will bring laughter into their day; use that God given gift, reach out and touch a hurting world with the love of God. Come and join our very friendly group who meets every Wednesday term-time only - 1.15p.m to 3.00p.m. The group is run by Cindy Tearle who is a qualified Nursery Nurse. We have Tricycles, scooters, push along's and cars in a designated area so the little ones don't get run over. We have a well equipped Baby area and a kitchen play area for the early walkers. We have a fantastic creative table run by parents who come up with some really good ideas each week, so far this term we had Valentine's cards, mother's day cards and soon we'll be doing something for Easter. We have drink and a biscuit time for the children and free access to kitchen hatch for parents/carers to get Tea/Coffee etc. Tidy-time is 2.45p.m when we then have our sing/song time before home. The Edlesbray Players present a revue entitled "Carry on Laughing", to be held in Eaton Bray Village Hall on Saturday 10th May. Tickets available from the Box Office on (01525) 222283. Fairy Tales! - make them come true on Saturday 5th July! Dressing up for the theme gives our carnival its special atmosphere. Remember the fancy dress float procession and make sure your group books for the parade - we can help you find a lorry for the parade - contact us on www.stmarysvillagecarnival.com for more information, and let's have more people in wonderful costumes on foot. Make sure you don't miss the best event of the year and help us raise funds for the Air Ambulance Service which provides a vital lifesaving service for our community. Book a Stall - guaranteed a busy day of trading! To book a pitch for your group or organisation at the biggest fete in Buckinghamshire, contact Chris Banks and you could rake in the profits. Give your stall the edge by dressing up for our theme...Fairy Tales! Advertise your business - and reach your customers! Our carnival programme is widely distributed and read by several thousand households and many local businesses advertise regularly in this publication. You can book adverts at a competitive price to reach your customers. Contact us through our website for details. The Carnival Queen, princess and attendants will be chosen at Eaton Bray Village hall on Sunday 27 April at 11.15am. Girls aged from 8 to 13 in the congregation of St Mary's Church or who live in Edlesborough, Eaton Bray, Dagnall or Northall may apply. Application forms are available from Yvonne Ranson. Completed forms to be returned by Sunday 20 April. Wanted... Helpers to join our team! Get into the great community spirit of our villages and help us have a fabulous carnival. If you've never experienced it, come and get involved- you'll get even more out of it and make new friends. Contact Peter Bennett. Help especially needed for Friday evening and clearing up on Saturday at 5pm. Village theatre company Front Row will be performing musical play Stepping Out at Eaton Bray Village Hall on 17th, 18th and 19th April. The show, written by Richard Harris, is about the lives, laughs and loves of a group of people attending a weekly tap dance class held in a dingy north London church hall. Director Wendy Baker said: "The cast of 10 have been working extremely hard, not only developing their characters, but also perfecting the different tap dances. "Rehearsals have been great fun and it promises to be a very funny play." 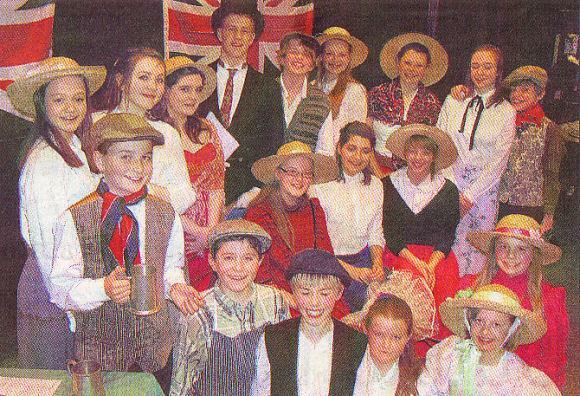 Performances take place at Eaton Bray Village Hall on Thursday April 17, Friday 18 and Saturday 19. Doors open at 7.30pm with performances beginning at 8pm. There is a licensed bar and tickets cost just £7 each. For more information or to book your tickets, contact the box office on 01525 221482. Playing against a strong and bitterly cold wind with the odd snow shower to contend with it was fifteen minutes before a great free kick from Dax put Lions into a well deserved lead. Lions' goalie, Toby, coped well with everything that came his way. Lions kept the pressure on and got a second through Charlie just before half time. With only seven players available, Lions unfortunately lost George towards the end of the first half due to an asthma attack. Starting the second half a player down, Lions put Freddie, Lee and Harrison as back three leaving Dax and Charlie to try and find a way through to score again. Some great runs from the front two put AFC under pressure, and a deflection off an AFC defender after a shot from Harrison gave Lions a well deserved third goal. Lions started with the slope and the wind in their favour and despite the vast majority of the possession and pressure coming from Lions it was still 0-0 at half time. Lions made substitutions at half time knowing that they had to work even harder to get a result. Even with the slope and wind against them Lions still controlled the game and it appeared to be only a matter of time before they would score. Then towards the end of the second half Lions got the goal that they had worked so hard for when Dax Roe rounded the keeper and put the ball in the back of the net. Lions kept the pressure on and a minute later Dax rounded the keeper again and got his second. This was a strong team performance with a well deserved result, MOM was Freddie Mines. In a well-balanced match in which both teams were giving their best it was the Lions who proved the stronger team. From Toby in goal, who made some great saves, through to Freddy and Jack in defence Lions looked solid at the back. George, Harrison and Lee controlled midfield well for Lions. Up front Dax, Charlie and Karl worked hard and gave Crawley problems throughout the match. After 17 minutes the pressure from Lions paid off when Harrison found some space and put them 1-0 up at half time. Against the run of play Crawley scored the equalizer four minutes into the second half. Lions kept the pressure on and after a great run and goal from Dax (who was MOM), they were back in front. George played a real captains role and held everything together so that Lions finished 2-1 winners to complete a great weekend. The opening half belonged to Lions as Adam and Dominic tested the Lewsey keeper time and again. Impressive attacks by way of Sean and Aarin kept the league leaders on their toes, forcing them out of a familiar comfort zone. The occasional onslaught broke through but it was only the most ferocious efforts that were able to get by the steadfast defensive work of James and Ben, who rarely limited themselves to one position. Keeper Dan, who has found a new form to improve on some already impressive work, expertly fielded the on-target attempts of some powerful Lewsey strikers to pick up a well deserved MoM award. The opening goal came from Dominic's neatly placed corner kick, which deflected from a Lewsey defender into the net. Following the break, a revitalised Lewsey emerged desperate to claw back the goal deficit. Lions brought out their defensive game and held off the home team with some consummate counter work which saw Mason midfield Chris made some impressive passing moves to find a well placed Tom, who retained the pressure throughout. Lewsey finally equalised with minutes to spare in an enthralling encounter. A bright sunny morning coupled with a very waterlogged pitch set the scene for the League Cup Quarter Final. The whistle blew and within two minutes of play Lions had made several attempts on goal. After a display of quick footwork by several players James Pearce landed Lions' first goal. It wasn't long before Jake Higgs powered a long throw from Nathan Sears into the back of the net. In the second half James Pearce made a great run up the pitch and outmanoeuvred the keeper to score again. Crawley Green started to put pressure on but Luke Dunstan stood firm in Lions' defence. Pearce was hungry for his hat trick and his patience was rewarded with another goal. Crawley Green quickly responded with a superb display of passing to score their first goal. Jake Higgs retaliated with a superb run up the field and a powerful shot straight into the net. Declan Tomlinson was Lions' MOM. The lopsided score-line reflects the size of the squads: Lions fielded nine players whilst their opponents had 14 at their disposal. Houghton Regis scored their first from a run up the right wing after just two minutes. For a period Lions held the home team at bay with tenacious defensive play by O'Connell, Thorne and Lancefield. Occasionally Coates or Marshall made a probing run forward, only to be overwhelmed by the home team defenders. Meanwhile, Houghton Regis steadily increased their goal tally to reach 5 by half-time. Coates donned the goalie shirt, allowing Cavendish to add his strength to Lions' midfield. Lions' determination earned them two corners, one shot just wide and another saved. Dear (MOM) was outstanding in Lions' defence and a clearance off the line by Moriarty immediately followed by a save from Coates even had the opposition supporters applauding. Unfortunately defeat was inevitable for the spirited but outnumbered Lions team. From 6th April, Mid Beds District Council will be responsible for accepting stray dogs found by members of the public. New rules mean the Police no longer have responsibility for accepting stray dogs but they will continue to be responsible for dealing with dangerous dogs. Anyone reporting a stray dog can continue to call Mid Beds on 01462 611222 (or 08452 30 40 40) during normal office hours and our Dog Warden will collect it as soon as she can. In addition, Mid Beds now provide an out-of-hours service, meaning that anyone holding a stray dog can call us on 07850 032360 from 5.00pm to 10.30pm Monday to Friday and from 8.00am to 10.30pm on weekends and Bank Holidays. The Dog Warden will only collect a stray dog held at a specific address out of hours - we cannot offer to search an area. All dogs found straying are taken to Appledown Kennels in Eaton Bray near Dunstable. Owners can arrange to collect their dogs from the kennels and will be asked to prove their identity and to pay a fee of £35.00 plus a kennelling charge of £8.00 per night. People in receipt of means tested benefit will be required to pay £25.00 plus any kennelling charge above the first £8.00. Payment can be made by cash or cheque direct to the kennels - debit and credit cards are not accepted. Steve Whittaker, Contract Services Manager at Mid Beds said: "Dog owners must take full responsibility and ensure that their dogs do not get out and stray. This would save them not only a trip to the kennels and kennel charges but also a lot of worry. We would strongly recommend that dogs are micro-chipped so that time can be saved in tracing owners and the costs to the owners of kenneling are reduced." You are viewing the April 2008 archive.